Traditionally, December sees the Band breaking out the Christmas Carol books and collecting tins for the year’s major fundraising drive. We rely so much on the support of the local people of the town, without which the band would find it hard to keep its doors open. The money raised during December pays for our running costs for a 12 month, and this year, despite some challenging weather our friends in the town didn’t disappoint. We all congratulate and thank the townsfolk for their magnificent support again this Christmas. It’s as traditional as “Fish and Chips”, as each December the band gets everyone in the festive mood with our Christmas Concert which, this year, was held at Abergavenny’s Borough Theatre. The 315 capacity auditorium was full to capacity with an audience appreciative of both Senior and Youth Bands music ably supported by guests, Monmouth Male Voice Choir. As usual, Youth Band Musical Director, Lana Tingay, targeted the men in the audience, “gently” persuading then to stand in front of the stage to participate in “12 Days of Christmas”. Youth Band and “Buzzers & Blowers” (our beginners) delighted everyone with some excellent playing and infectious enthusiasm. Monmouth Male Voice Choir added some vocal texture to the evening. The choir was formed in 2012 by a small group of friends under the direction of Aneurin Hughes; their ambition, to bring the tradition of Welsh male voice singing to the border town of Monmouth. The Choir has been so successful that, in just six years it has already performed twice at the Royal Albert Hall, sung at concerts in St David’s Hall Cardiff, competed in the National Eisteddfod when held in Abergavenny and sung the anthems, in front of their largest ever audience, at the Principality Stadium prior to the Wales v Scotland international in 2016. The Senior Band’s contribution started with a unique arrangement of Christmas Carols set in the style of the “Indiana Jones” theme. We were particularly delighted to feature our new Principal Cornet, Kristyann Symonds, in a beautiful solo rendition of “Have yourself a Merry Little Christmas” by Hugh Martin & Ralph Blane. No doubt, by the appreciation shown by the audience, there’ll be many more traditional Christmas concerts to come. The band joined an exciting day of contesting at Willows High School in Cardiff on 24th November to mark the final leg of the 2019 Welsh League series. 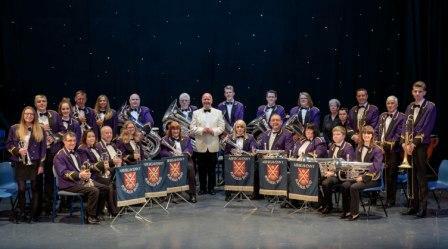 The South East Wales Brass Band Association's Autumn Festival Contest saw the destinations of the various section titles decided; and despite a somewhat difficult year, the Band was delighted to achieve second place in Section One. The test piece for the day was James Curnow’s “Trittico”, a piece we last played in the Championship section in 2015. Adjudicator, Stan Lippeatt, found lots to praise the band for in its rendition of the music and commended several individual and sectional performances, awarding the band 2nd place. 11th November 2018, one hundred years after the end of the First World War, a large number of ceremonies and religious services took in Monmouthshire to commemorate the contribution of British and Commonwealth military and civilian servicemen and women in the two world wars and later conflicts. Overall, what was a very emotional and moving experience for us all was topped off by our young cornet player, Lowri Powell (18yrs) who confidently played the Last Post and Revellie for the first time. Adjudicator, Ian Porthouse described our own choice test piece for the WWBBA contest in Haverfordwest as “probably the finest piece of music written for brass band”. He went on to say that our choice was “very brave” and obviously challenged the band on a number of levels. Little did he know how many youngsters from our youth band participated in the performance, so awarding the band 4th place was a testimony to the hard work of Youth Band MD, Lana Tingay and the excellent performance of the youngsters on the day. Musical Director, Sean O’Neil, was “delighted with the [playing]” and congratulated one and all for a tremendous performance on the day. 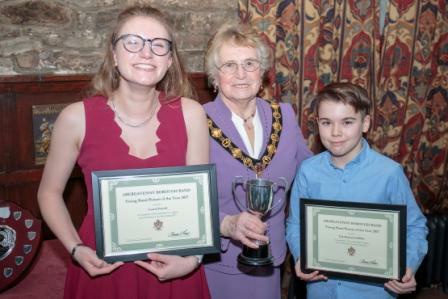 He added that “It was one of the best musical performances the band has given on a contest stage during my association with Abergavenny Band” and thanked everyone for their hard work and dedicated effort in the rehearsal period leading up to Saturday. It is a musical journey we are all on and whereas we may have chosen to play something less musically demanding, for so many of our young band members, who all acquitted themselves brilliantly on Saturday, this was a huge musical challenge and even our most experienced players should and I’m sure will have taken a huge amount away from this performance. Abergavenny Brass Band has gone through many trials and tribulations over the last 12 months, the choosing of this work Resurgam, ‘I Shall Rise Again’ was no cheap shot, the performance experience was superb and, no matter what the result, the musical performance is something we can all be extremely proud of and more importantly build on for the future. Very many heartfelt thanks and congratulations for realising such a wonderful performance. The band returns to West Wales once again to play in The WWBBA contest in Haverfordwest on 13th October. Whereas all our hard work preparing for the contest has focussed or attention on the task ahead, we are also looking forward to a joyous and entertaining evening at the Sea Vew Hotel in Fishguard where we will all be staying overnight. This writer is reliably informed that lots of fun and games have been planned to entertain us. 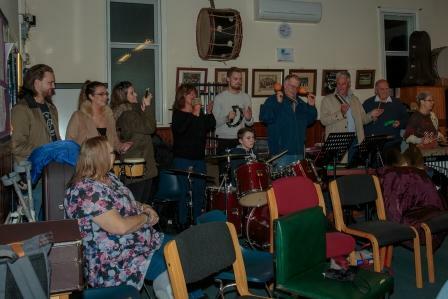 There have been a number of changes at Abergavenny in recent months, and change brings opportunity that the next generation of budding musicians are eager to take advantage of, while giving the 'golden oldies' the opportunity to support what is at the core of the band's ethos - nurturing the young. Abergavenny has a proud tradition of musical education that continues to thrive with the Youth Band under the Direction of Lana Tingay. Opportunity has knocked for many of them at the right time and given them the chance to play in the Senior Band. In Abergavenny Band one thing remains constant, its sense of comradeship and community. Whoever is playing or leading the band as an organisation, it values above all else, integrity and respect to each other and a sense of responsibility to fellow players and the band itself. An important lesson for our aspiring youth to take forward along with their musical progression. After a long hot summer it was a surprise to see the bandstand at Bedwellty Park in Tredegar vacant on Sunday 12th August. It was our turn to join the extensive list of bands and choirs to perform at the park but the weather wasn’t kind on this occasion. But not to be thwarted, we took to the impressive Coach House to the rear of Bedwellty House where our concert was welcomed by the usually appreciative audience. Musical Director, Sean O’Neil was delighted to receive some very complimentary comments from the audience. A supporter of Tredegar, Roy Dallimore, congratulated the band on its playing, repertoire, and he was impressed that the band concluded with the National Anthem. Several players were on their annual holiday for this occasion so the Band was grateful for the help so kindly given by guest players on the day. Sunday 8th July was a scorcher. 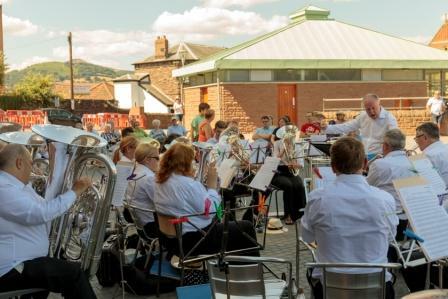 Thankfully, for our afternoon concert at Abergavenny’s Brewery Yard, the band enjoyed the shade of the Market Hall whereas the poor audience were not so fortunate. Never the less there were many visitors to the town who enjoyed the concert, some from the antipodes, as well as locals who made up a very appreciative audience. The Band delivered a varied two hour programme that included the classics, traditional brass band pieces and more modern popular items from the shows. Another Mayor under our belt! A regular function for the Band is to play at the official ceremony in the Borough Theatre for the installation of the new Mayor. 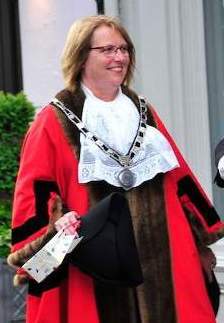 Retired teacher, Teslin Davies was officially elected as the new Mayor of Abergavenny at the ceremony and the band was proud to entertain her assembled councillors, officials and guests for the evening. Puffing on a Bank Holiday!! For the two days of the year Abergavenny is redolent with the sounds, smells and sights of a bygone era. 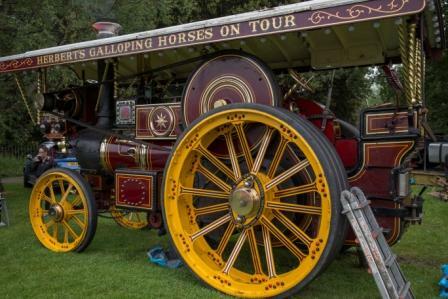 Mighty steam traction engines, resplendent in their colourful liveries, with smoke belching from their chimneys, pistons clanking and hissing steam, are still the flagships of a fantastic day out within the Seven Hills of Abergavenny. Steam organs are an unusual sight these days, and the rally regularly hosts three different machines, one of which is used as the accompaniment to can-can girls dancing to a mighty steam organ. And once again, this cacophony of sound was silenced by the Senior and Youth Bands who took up their regular bandstand place in the proceedings, providing great entertainment, superb music and yet another splash of colour in a field of redolent colours. As MD Sean O’Neil said when he introduced Phillipe Schartz to the audience at the Borough Theatre on Saturday evening “you will see smoke coming from the valves, such is the speed of his playing”. Well, they weren’t disappointed. Phillipe was our guest performer at the Celebration concert held by the band on Saturday 19th May and it was a real honour for the band to accompany such an accomplished musician. 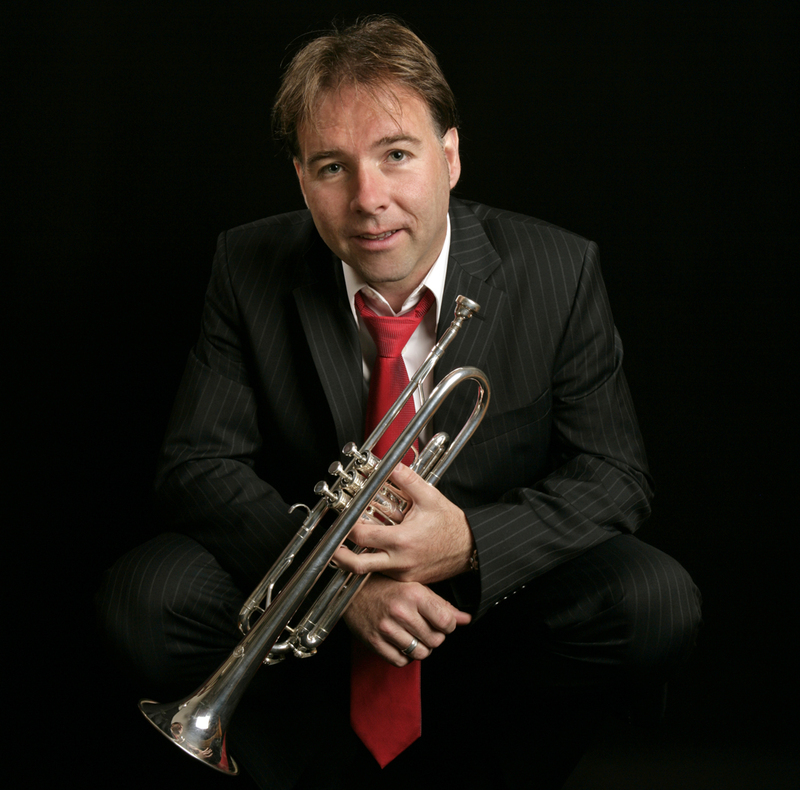 Phillipe is the Principal Trumpet player for the BBC National Orchestra of Wales and with this in his extensive CV, it was a delight to see him sit in amongst some of our younger players on stage when he wasn’t performing his solo repertoire. He set out his stall with an amazing rendition of “Charivari”, a ‘Latin Fantasy’ by John Iveson and followed this with the evocative “Send in the Clowns” by Stephen Sondheim arr. Alan Fernie which he delivered on the sultry tones of his Flugel Horn. The band played several exciting pieces in the first half one of which was the “thigh slapping” traditional piece from the Austrian Tyrol “Tyrloean Tubas” by Maurice Clarke played by our five Tubists. This preceded the exciting finale for the half as the Band took everyone to Eastern Europe with A Klezmer Carnival. We can always rely on our youth band to get fingers clicking and feet tapping and today was no exception. The youngsters kicked off the second half with a varied repertoire under the direction of Lana Tingay. Part two from the senior band also didn’t disappoint as Phillipe amazed everyone with his renditions of Geoffrey Brands arrangement of Herman Belstedt’s Napoli and Harry James’s Concerto for Trumpet. 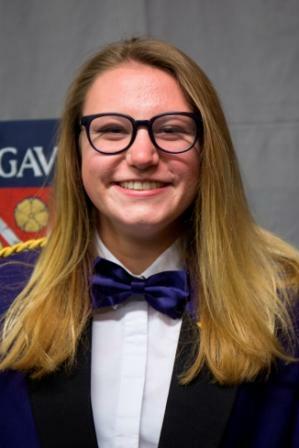 He was complimented by our own soloist, Catriona Barr whose delivery of that sultry euphonium Solo “Jeanie WithThe Light Brown Hair” pulled on everyone’s emotions. Sadly this was to be a farewell performance for Principal Euphonium player, Catriona, who returns to the USA for the summer before resuming her music studies in the Autumn. The Band is proud to welcome Phillippe Schartz as guest soloist for our concert at the Borough Theatre on 19th May. 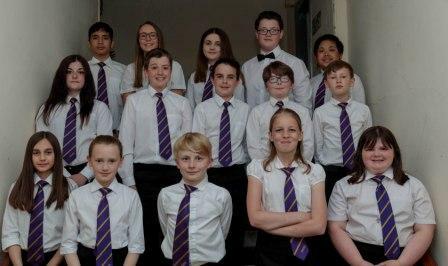 Our journey to the Brangwyn Hall in Swansea this year for the Welsh Regional Championships on 17th March saw the band return to the first section after its winning performance in 2017. A much anticipated performance, after weeks of rehearsal, gave the adjudicators much to commend the band on but there were too many technical playing issues to lift the band off the final 10th place on the day. Never the less, players left the stage having delivered a confident and robust rendition of the test piece, Brass Metamorphosis by James Curnow. But a disappointing climax to all the hard work from the individual players and MD Sean O’Neil. The band will now focus on the busy year ahead. This year’s annual dinner and awards evening was tinged with sadness as the band said farewell to former President, Ray Hill, at his funeral earlier that day. A touching service was held at St Mary’s Priory Church in Abergavenny when a small number of band members played for the congregation of family, friends, civic dignitaries and town folk who gathered to pay their respects to this much-loved servant of the town. Ray attended many Band dinners with his wife, Muriel, and they would have thoroughly enjoyed this year’s occasion where the best of the bands achievements and players were celebrated. 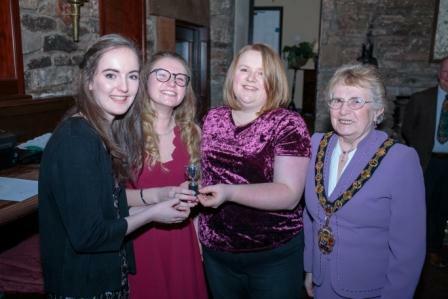 It was a well-attended event held at the Bear Hotel in Crickhowell on 9th February, with over 50 players and guests enjoying fine fayre and applauding the various musician awards and enjoying the more light hearted presentations that followed. Our guests for the evening were Mayor & Mayoress of Abergavenny, Councillors David and Penny Simcock, Chair of Monmouthshire Council, County Councillor Maureen Powell & Mr John Powell, County Councillor Sheila Woodhouse & Chris Woodhouse and Alison & Geraint Thomas. 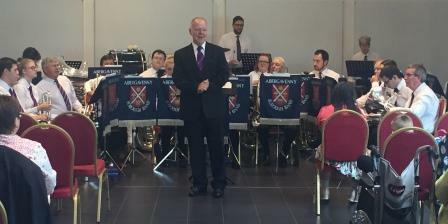 Band Chairman, Terry Prosser, gave his usual humorous welcome address and congratulated the band on its many achievements during the year, both on and off the contest stage. He also drew our attention to the fact that his age now exceeded the combined ages of his three fellow tuba players……its good to have some experience amongst all that youthful enthusiasm! The first award of the evening was the Young Band Person of the Year (Presented by Maureen Powell) and voted for by the members of the band. This was jointly awarded to Zak Roynon-Griffiths (percussion) & Lowri Powell (Cornet). 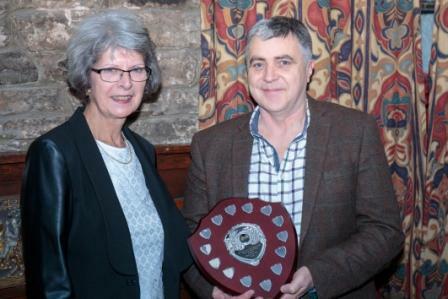 The second award, again voted for by the band members, was Band Person of the Year (Presented by Mayoress Penny Simcock) was awarded to Band Manager Ian Howe. Then there came two Musical Director’s awards chosen and present by our MD, Sean O’Neil. The MD's Award for best Instrumental Section went to the Trombones, Ian Howe, Jonathan Tingay & Stepen Moore; and the MD's Award for best Individual Player went to Jonathan Mudd. Then humour crept into the proceedings as Resident Conductor, Lana Tingay, took control of proceedings. Not normally renowned for his soave and debonair dress sense, we were all staggered to learn from Lana that Richard Shorey had been awarded the crown of “best dressed bandsman”. It would appear that Richard had discovered, lurking in the bowels of the band room wardrobe, an ancient bandsman’s uniform complete with hat and red and gold piping. Having never seen such sharp outfits before, he could not resist the temptation to model the outfit, which turned out to be a perfect fit! 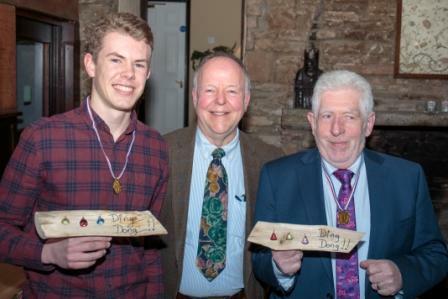 The merriment continued with the “Ding Dong” award to the players of the tuba section who missed their start to “Dingdong Christmas” at the concert in December, and a prize for the disorganised Bass Trombone player who left his families band uniforms in the house on contest day. Then there was the initiative test for youngsters in the band. Which team could build the largest self-supporting structure from a load of junk? For their astounding model of the Eifel tower collapsing the award went to “the girls”. We all may have a “bucket list” and there are probable some things on the list which may never be realised. But don’t give up hope…a chance comment at the Bands’ Christmas concert by 82yrs old Jean Lockey from Pontypool to her close friend Brenda Vater led to the realisation of a long held desire to conduct a brass band. Jean and Brenda are regular concert goer’s and have heard the band on several occasions. As soon as Jean mentioned her wish, Brenda wasted no time in contacting the Band and asking if we could help. 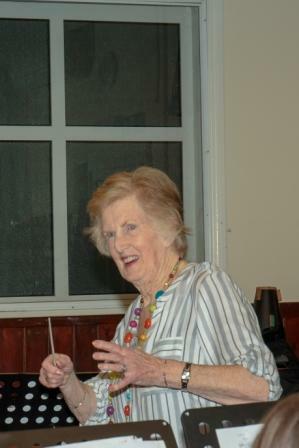 On Thursday 25th January we were delighted to welcome Jean, Brenda, family and friends to the band room so that Jean could try her hand with the baton. Jean proved very adept at conducting and soon had the band under her control, firstly playing a march followed by Cornet Rock and finishing with Happy. Her family and friends may have thought they were coming along to observe but resident conductor, Lana Tingay, had other ideas and they were soon grappling with a variety of percussion instruments as they played along with the band. A very enjoyable evening was rounded off with tea and biscuits as Band Chairman, Terry Prosser, presented jean with a bouquet. So don’t despair, share your wish with a close friend like Brenda, and who knows what may happen. 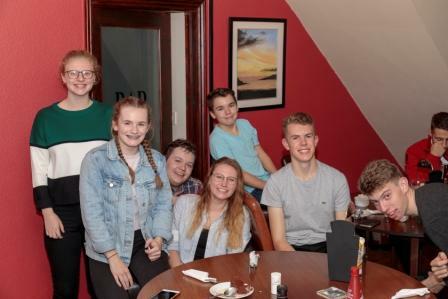 In the group photo are some of Jeans family and friends, Steve Lockey, Gill and Ian Rowlands, Lauren and Joshua Rowlands, Kelvin and Brenda Vater. FORMER Band President Ray Hill has died suddenly at his home in Chapel Road. The band is saddened by the news that our former President of 26years has passed away. Although he could not play a brass instrument, his enthusiasm for supporting and representing the band at every opportunity was boundless, and we were always at the forefront of his thoughts when promoting the town he loved so much. Mr Hill served as Mayor of Abergavenny on five occasions after being elected to Abergavenny Town Council as an independent councilor in the late 1970s and was widely respected for his forthright views. On his retirement from the town council he became one of only a handful of people to be made an Honorary Burgess of the town in the last thirty years. His predecessor as Band president was Jack Johnathan who was also an Honorary Burgess of the town. Ray was always keen to support the band in any way he could and was often seen in the town with a collecting tin when we played, helping to raise funds for the band. When Ray decided to retire as Band president he introduced the Band to his friend and local business man Alan Griffiths who kindly accepted the nomination to become his successor. Ray is pictured here (left) with Alan Griffiths. He well be greatly missed by the Band and out thoughts are with his wife Muriel and family members.